This is part 21 of a 31-part posting of my journal entries and photos from one of the greatest experiences of my life so far--a month-long mountain climbing trip to the Atacama Desert area of northern Chile and Argentina, which included summiting three 6000 meter peaks (~20,000 feet). To view all the entries in this series, check the posts labeled South America. 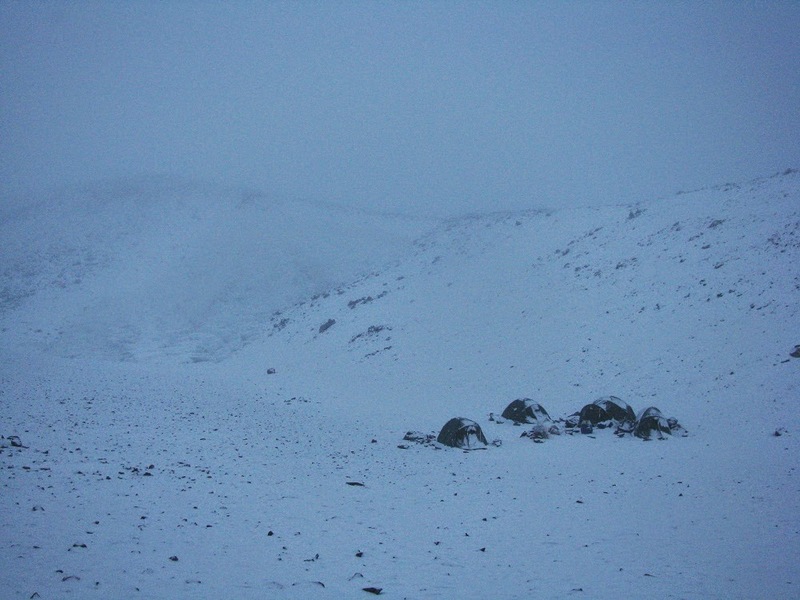 It was a bleak morning at our isolated base camp at 18,250 feet, 30 miles from the nearest road. 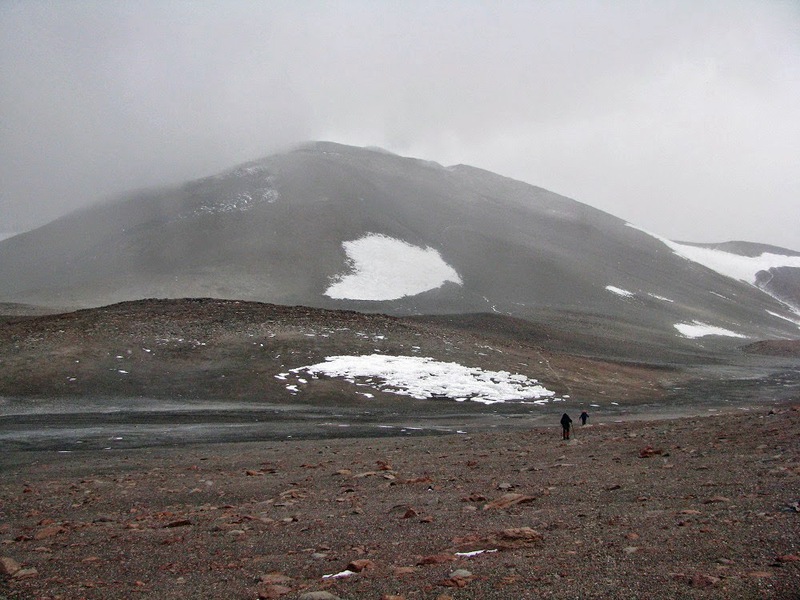 It was not at all clear that we would be able to leave camp at all, let alone attempt a 20,000 summit. I was very slow to fall asleep - very restless and also hot! I had overdressed for the weather, which remained foggy and mild (ranging in the upper 20’s). I think the relatively rapid change in altitude and the high altitude (18,250 feet) were underlying factors too. As my body struggled to adjust, that struggle seemed to manifest itself as a dream-like effort to “figure this place out.” And through the night I did seem to figure it out in a strange succession of dreams in which I discovered “spirits” of the place behind hidden doors or at prominent rocks. I found and “recognized” or understood them one by one through the night until there were 20 or 25 of them. Yet with each new one, the sense of simplicity or unity of the place kept increasing, and thus my ease of sleeping. In the end I was getting good chunks of sleep. Meanwhile the weather provided an unexpected turn. It never really cleared up, and never really stopped snowing all night. Through the night the total accumulation was less than an inch. After light began arriving I got up at 7AM sharp to go out and pee; and I found the fog and snow continuing. The camp looked much bleaker than the previous camp because of the fog and gray, dreary conditions (see photo above). I came back to my tent and caught up on my journal, finishing at 7:40 about the time that other people seemed to be stirring. The plan was for an 8AM breakfast and a 9AM departure for the Medusa climb: 2000 feet up and about 7 or 8 km round trip as the crow flies. That’s not a difficult effort if the weather cooperated. Our expedition leader John decided to give it a try. We headed off, hopeful but not confident, at 9:45, with the weather still foggy and spitting snow, but with a few blue patches. As it turned out the weather stayed that way: marginal and improving only slightly. Brian stayed in camp because he had a poor night of sleep and still seemed to have an altitude related headache. Phinella moved slower than the other 3 of us clients, usually 10 to 15 minutes slower at each hourly stop. There was a lot of minor up and down and traverse for the first few miles, then we abruptly hit the base of the symmetrical cone shape of Medusa: a pretty mountain, though we only had a full view of it later on the way out. Here’s that view. We made steady progress up the 2000’ ascent. Because of the fog and snow threat everybody always stayed in sight of one another. Finally when we were about 45 minutes from the top, John took a GPS fix at a shelter rock and had Phinella and Damian stay there while we summited. I led the way on the final scramble up a hill made of spiky volcanic rock. It was the highest I had ever been. 20,000 feet!!! I made it! We only stayed a few minutes at the summit because of the threat of weather closing in. We made a bee-line back to Phinella and Damian then a quick descent to the base of the cone. We passed beside the base of the snow field visible on the side of the mountain in the overview shot above. 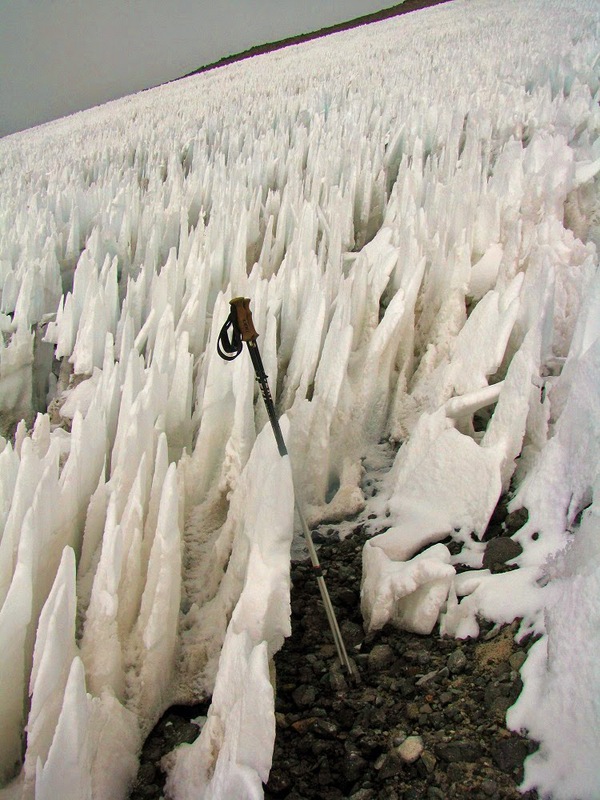 It was made up of spiky ice formations called penitentes, caused by the high summer sun and dry air. On the final ascent and the descent I was moving at speeds that were beyond my comfort zone so I was really spent crossing the final couple of miles of up and down. Here’s another summit shot—of the really pretty round crater lake beneath the summit rim of Medusa. I wish we could have experienced the view of that and of the surroundings in all their glory! My beyond-comfort-zone speed proved to be necessary because the weather began closing in. It began to snow big grains, soon becoming thick enough to hamper visibility. And then thunder began off to the west over Ojos. That appeared to move over to the Medusa summit. Several times I just stopped and broke into tears of exhaustion and some gratefulness that things hadn’t gone worse. 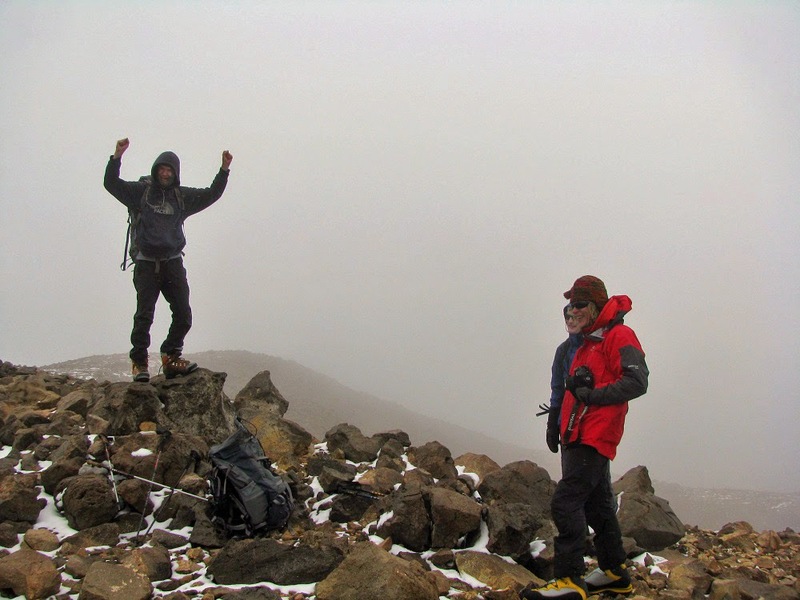 It was snowing hard by the time we got back to camp at 3:30, we had a little snack and some hot tea then everybody retreated into tents. Half an hour later the storm abated and I went out for a bit, but soon it returned. I basically spent the afternoon deep in my sleeping bag with all layers on just trying to warm up. It was a slow process, took an hour and a half or more before I was comfortable again with warm hands and nose. It continued to snow more lightly until 7PM. They brought around dinner at 6:30 then from 7:30 to 9PM most of us stood around outside with calm winds and the sky clearing partially. The temperature dropped from near freezing to around 25. I retreated to my tent and caught up on my journal. That was done at 8:55, then I snuggled back in my sleeping bag, still with all layers to get fully warm again before changing into the correct and comfortable layers for the duration of the night. I did that about 9:20 and went to bed.